Nothing speaks to the holidays like a warm cup of tea and some online shopping -- let this giveaway hook you up my friends! This is your chance to win a $50 Amazon Gift Card to do some holiday shopping for your family (or yourself, let's be honest) online or an amazingly tasty tea pack from Mighty Leaf Tea to keep you warm during this winter season. 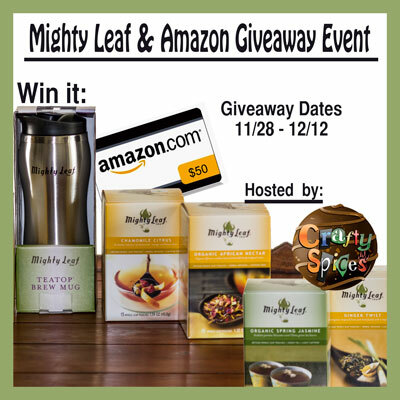 Have you heard about this giveaway: it's a Mighty Leaf Tea pack (ARV: $57.00 ) and a $50 Amazon Gift Card. 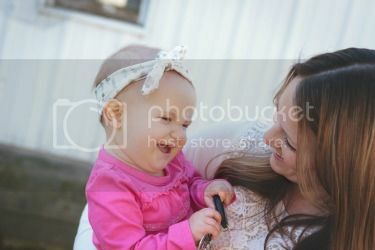 If you drink Tea you will love Mighty Leaf Tea, or they can make a lovely holiday gift; and come on, who does not love Amazon Gift Cards. Jay @Crafty Spices has done a review on the Mighty Leaf Tea, you can read all about them right here, she is also hosting this giveaway and granting us the opportunity to win some great tea for the holidays. This giveaway will begin on Thursday, November 28th and will end on Thursday, December 12th, it is open to all U.S. and Canada residents age 18 and over, void where prohibited. 1st one will win a Mighty Leaf Tea Prize Pack (4 15-pouches boxes of Mighty Leaf Tea and a Tea Top Brew Mug - ARV: $57.00). 2nd winner will receive a $50 Amazon Gift Card (Code send via email). Disclosure: Jay @Crafty Spices did receive products for free and is sharing her opinion with you. Her opinion may differ from ours and yours. Neither Crafty Spices or High Heels and Hot Deals are responsible for sponsor prize shipment. Winner(s) will be contacted by email and will have 48 hours to respond before another winner is selected. All entries will be verified. I buy Mighty Leaf at Kroger down the street from my house in Wichita, KS. Baby #2 Update -- 38 Weeks and Fully Cooked!